At one point I was definitely a chicken hoarder. I’ve now been able to rein myself in to keep it at a respectable 12 hens. Well, right now we have 11 hens, but we’re hoping to get some new chicks here next month. I remember when we got our first three girls. I would sit out with them totally mesmerized by their chicken-ness. As the pecked and scratched and bathed in the dirt I would just watch in amazement. Bringing in our first chicks wasn’t any less magical. I was intrigued by how mama would let the chicks hang off her waddle without even a flinch. She protected them like they were part of her (even though we had brought them home from the feed store). We’ve had many chicks since then, the majority we raised rather than having a hen do it, but I still really enjoy having them around. When Spring comes they squat in front of you (to them you are the rooster) and let you pick them up. I love chickens. Who knew? I want to share the chicken keeping experience with everyone and have ended up turning into The Chicken Pusher. Unlike being a meth or crack pusher, I’m here to better your life. So here are some reasons why you should get chickens. 2. They take care of pests and weeds. 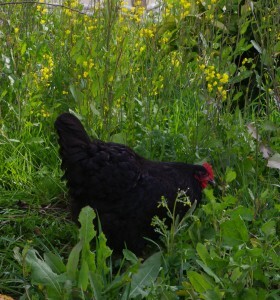 The photo of the hen at the beginning of this post was taken when they were first moved into that area about a month ago. Now the weeds are all trimmed short and there isn’t any sign of the real problem weeds we have going on. They have a particular penchant for Bermuda grass, which is awesome for us. Of course they also love bugs. Chickens are omnivores. Don’t let the “All Vegetarian Diet” on a carton of eggs fool you. They need animal protein to be healthy, especially during their seasonal molt which can really tax them. And did I mention that they also kill rodents? Yeah, chickens are pretty awesome. 3. They are super easy keepers. With an automatic waterer and large feeder you don’t have to tend to their basic needs that much. Even less if you allow them to free range. The only daily chore for our chickens is collecting eggs. When free ranging they also don’t require as much coop cleaning. We like to utilize deep litter here anyways, which really cuts down on cleaning while also keeping them healthy. You don’t need a rooster to have hens that lay (roosters can sometimes stress hens out too much so they lay less). Plus hens are pretty quiet only making noise for less than 10 min. a day right after laying an egg. This usually occurs late morning and early afternoon. They make no noise between sunset and sunrise. I wish I could say the same about some dogs in our neighborhood. 4. They make your compost. And they make enough of it that you will probably never have to bring offsite compost home again depending on how many chickens you have and how big your garden is. They really are great for low-input gardening. 5. They are entertaining and make great pets. Even though we don’t handle ours much they are still pretty friendly. They let us pick them up and handle them if we need to. If you do handle yours a lot from the very beginning they easily bond with you and can be great for kids. 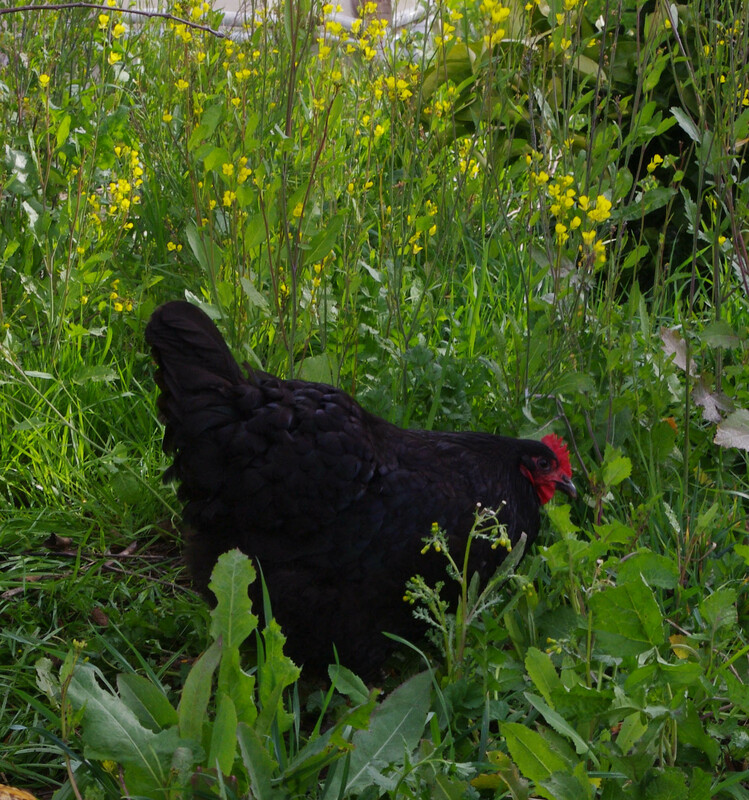 There are of course many more reasons why you should consider having chickens. This is just a good list to get you started on thinking about why you should get some chickens of your own. Yay! Chickens! I never expected to love them so much, but they are so entertaining and each has their own personality.